Did you know that I love to cook with beans?? Not only are they one of the most frugal sources of protein, but they’re also filled with fiber and nutrients. Luckily my husband loves beans as much as I do, in fact his favorite meal is beans and cornbread. If you’ve never tried cooking dried beans before then I would highly encourage you to try my slow cooker recipe. It really is easy and fool-proof. Plus, you can freeze the extras or make one of these amazing recipes with them! And when you cook them yourself, they are not only cheaper, but also healthier than the canned variety. If you’re trying to cut down on your grocery bill, but also eat healthy then I would recommend replacing meat with beans at least once per week. I put this list together to give me some new ideas and encourage you to try something new with this amazing, yet very under appreciated vegetable. Enjoy! What’s your favorite way to cook with beans? I’d love to know! My husband is just the opposite and doesn't like beans at all (unless I puree them or mash them). It makes it difficult to make things with beans, but sometimes you gotta eat what's good for ya! I still make them and he complains a little, but it's not every day we're eating beans. 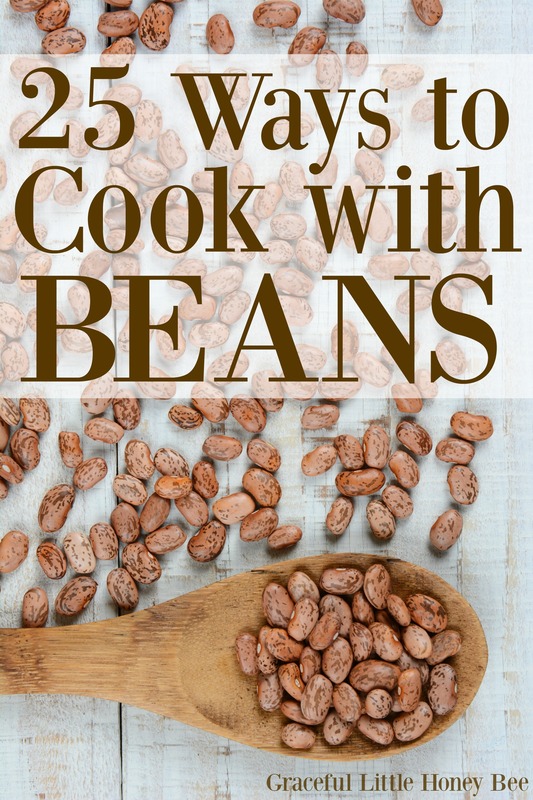 This is a great list of bean recipes, thanks! I love cooking with beans!! I would actually be pretty happy with bean burritos regularly once a week, but hubby doesn't seem to be as enthused about them. This is such a great round up of bean recipes. Thanks for sharing my bean and cheese pupusas! I have on occasion taken dry beans and ground them into flour using a whisper mill; as long as the uncooked bean has no oils you can do this. I then used the bean "flour" to make a creamy soup, in exchange of canned condensed cream soups, to use in a casserole. Much healthier and really nice rich flavor. I made this for dinner tonight with an avocado shrimp salad. I had no clue rice and beans could taste this amazing! Thanks for sharing the recipe! I would like to get some recipes for day old red beans. After the first day of beans I can'tell get my family to ear the red beans , no matter what I cook km to go with ie. cornbread, tortillas. I have also tried refried you name it. I would consider some more refried recipes if you have them. Thank you so much, I really like your website also. Have you tried Chili? Or Taco Soup? We lived in Honduras for a while. They used red beans for burritos and tostados. instead of pinto). I assume you are talking about the small red beans and not kidney beans). Do you not like lentils, Missy? I know some people think they have an odd taste but I learned to like them back in my hippie vegetarian days when they were the cheapest protein going. One recipe I really like is called “Lentil Sauce over Egg Noodles.” The sauce (though not necessarily the noodles) are good both hot and cold. Cold is nice for me here in Arizona (108 today, supposed to be 116 by Saturday). The sauce is basically tomato, onion, lentils, herbs and spices. There is a funny story attached to this recipe, which I found it in a vegetarian cookbook that was old, even then (c1970). Now, my mom was a great cook but my sister and I didn’t learn much from her – I’m sure that was mostly our fault but my mom was a bit impatient when it came to teaching, too and I actually did learn to bake all kinds of things from my father, who baked most Saturdays as a hobby. Anyway, this recipe called for “2-3 cloves of garlic.” Now, I knew, of course what garlic was (although I don’t think I’d ever, at that time, used a real garlic, just the powder). I also thought I knew what cloves were. They were the things you sometimes used in baking or stuck whole into oranges at Christmas to create a nice smell. But I had no idea that the sections of garlic were called cloves. So, not knowing what to do, I proceeded to add both. I think it was a couple of years before I realized my error but by then, it was too late. I liked the cloves and they’ve stayed in my recipe ever since. I also occasionally make a lentil patty. In this case, I put the lentils through a grain mill (although you could also process them after cooking), add water, egg, and whatever spice I’m in the mood for and then fry. At the end, they are covered with honey. I don’t’ even like honey but I like it with these. Out of the blue, I was watching a tv documentary on Biblical Foods recently and they had almost the exact same recipe featured. They said it is believed to be the “love cakes” mentioned in some translations of the Song of Solomon. Finally, Hummus. I'm almost addicted to hummus! I eat it every day, either for breakfast or lunch. It is a bit expensive but it is a bit cheaper if you make it yourself. Also, you can use the same recipe with white beans (I always prefer Navy to Great Northern or Cannellini but that’s a matter of opinion, I sure). The only thing you change is you put a bit less lemon in and add some rosemary. I still prefer the garbanzos for hummus, but the other isn’t bad. I've only made lentils a couple of times in soup. That's funny about the cloves and garlic! I am quite intolerant to dairy and went plant based about a year ago, after getting bored with beans i learned to quickly spice them up. a really cool way i found i can replace cheese. besides vegan cheese (wichis really expensive btw).... is with white bean cheese!!! you basically overcook them process with oil or andy plant milk and put some nooch in it . a recepie is quite unecessary just do it by eye can't go wrong!!! even if you arent alergic,vegan or anything try it out it will slash your cheese consumption!